Social Welfare History Project Keller, Helen — Story of My Life: Part 3. Keller, Helen — Story of My Life: Part 3. Helen Keller proved to be a potent propagandist for the oralist cause. She felt that gaining the ability to speak was freeing—indeed, one of the most important experiences of her life. Even though her speech was never easily comprehended by strangers, it allowed her to communicate directly with them, rather than through Anne Sullivan. 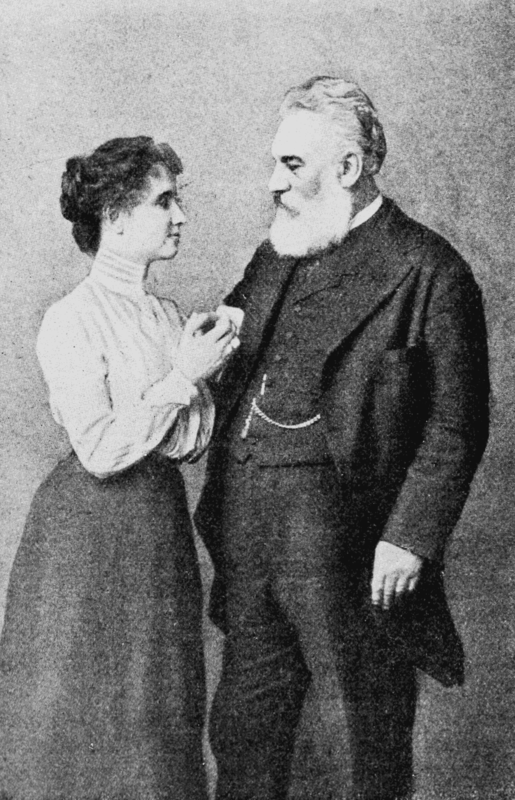 Oralists such as Alexander Graham Bell made similar arguments, suggesting that sign language isolated deaf people from their families and the rest of the American nation. Keller’s account supported this view of sign language. At the same time, Keller’s account is far more revealing than Bell’s or Fuller’s about the immense and constant effort that it took for her to learn and maintain her speech. THE next important event in my life was my visit to Boston, in June, 1888. As if it were yesterday I remember the preparations, the departure with my teacher and my mother, the journey, and finally the arrival in Boston. How different this journey was from the one I had made to Baltimore two years before! I was no longer a restless, excitable little creature, requiring the attention of everybody on the train to keep me amused. I sat quietly beside Miss Sullivan, taking in with eager interest all that she told me about what she saw out of the car window: the beautiful Tennessee River, the great cotton fields, the hills and woods, and the crowds of laughing negroes at the stations, who waved to the people on the train and occasionally brought delicious candy and popcorn balls through the car. On the seat opposite me sat my big rag doll, Nancy, in a new gingham dress and a beruffled sunbonnet, looking at me out of two bead eyes. Sometimes when I was not absorbed in Miss Sullivan’s descriptions I remembered Nancy’s existence and took her up in my arms, but I generally calmed my conscience by making myself believe that she was asleep. When the train at last pulled into the railroad station at Boston it was as if a beautiful fairy tale had come true. The “once upon a time” was now; the “far-away country” was here. ON OUR arrival at the Perkins Institution for the Blind I at once began to make friends with the little blind children. It delighted me inexpressibly to find that they knew the manual alphabet. What happiness to talk with other children! Until then I had been a foreigner speaking through an interpreter. In the school where Laura Bridgman was taught the dream of my childhood was realized. It took me some time to appreciate the fact that my new friends were blind. I knew I could not see; but it did not seem possible that all the eager, loving children who gathered around me and joined heartily in my frolics were also blind. I remember the surprise and the pain I felt as I noticed that they placed their hands over mine when I talked to them and that they read books with their fingers. Although I had been told this before, and although I understood my own deprivations, yet I had thought vaguely that, since they could hear, they must have a sort of “second sight,” and I was not prepared to find one child and another and yet another deprived of the same precious gift. But they were all so happy and contented that I lost all sense of pain in the pleasure of their companionship. Nancy had a sad experience soon after my arrival. She was covered with dirt — the remains of mud pies I had compelled her to eat, although she had never shown any special liking for them. The laundress at the Perkins Institution secretly carried her off to give her a bath. But this was too much for poor Nancy. When I next saw her she was a formless heap of cotton, which I should not have recognized at all except for the two bead eyes which looked out at me reproachfully. One day spent with the blind children made me feel thoroughly at home in my new environment, and I looked eagerly from one pleasant experience to another as the days flew swiftly by. I could not quite convince myself that there was much world left, for I regarded the city as the beginning and end of creation. The next day we went to Plymouth by water. This was my first trip on the ocean and my first experience in a steamboat. How full of life and motion it was! But the rumble of the machinery made me think it was thundering and I began to cry, because I feared we should not be able to have our picnic out-of-doors if it rained. I think I was more interested in the great rock on which the Pilgrims landed than in anything else in Plymouth. I could touch it, and perhaps that made the coming of the Pilgrims and their toils and great deeds seem more real to me. I have often held in my hand a little model of the Plymouth Rock which a kind gentleman gave me at Pilgrim Hall, and fingered its curves, the split in the centre and the embossed figures “1620,” and turned over in my mind all that I knew about the wonderful story of the Pilgrims. Just before the institution closed for the summer it was arranged that my teacher and I should spend our vacation at Brewster, on Cape Cod, with our dear friend, Mrs. Hopkins. I was delighted, and my mind was full of the prospective joys and of the wonderful stories I had heard about the sea. My most vivid recollection of that summer is the ocean. I had always lived far inland and had never had so much as a whiff of salt air; but I had read in a big book called “Our World” a description of the ocean which filled me with wonder and an intense longing to touch the mighty sea and feel it roar. So my little heart leaped high with eager excitement when I knew that my wish was at last to he realized. After I had recovered from my first experience in the water I thought it great fun to sit on a big rock in my bathing-suit and feel wave after wave dash against the rock sending up a shower of spray which quite covered me. I felt the pebbles rattling as the waves threw their ponderous weight against the shore; the whole beach seemed racked by their terrific onset, and the air throbbed with their pulsations. The breakers would swoop back to gather themselves for a mightier leap, and I clung to the rock, tense, fascinated, as I felt the dash and roar of the rushing sea! I COULD never stay long enough on the shore. The tang of the untainted, fresh and free sea air was like a cool, quieting thought, and the shells and pebbles, and the seaweed, with tiny living creatures attached to it, never lost their fascination for me. One day Miss Sullivan attracted my attention to a strange object which she had captured basking in the shallow water. It was a great horseshoe crab — the first one I had ever seen. I felt of him, keeping my fingers out of the way of his pincers, which snapped continually, and thought it very strange that he should carry his house on his back. It suddenly occurred to me that he might make a delightful pet; so I seized him by the tail with both hands and carried him home. This feat pleased me highly, as his body was very heavy, and it took all my strength to drag him half a mile. I would not leave Miss Sullivan in peace until she had put the crab in a trough near the well where I was confident that he would be secure. But next morning I went to the trough, and lo, he had disappeared! Nobody knew where he had gone or how he had escaped. My disappointment was bitter at the time; but little by little I came to realize that it was not kind or wise to force this poor dumb creature out of his element, and after a while I felt happy in the thought that perhaps he had returned to the sea. IN THE autumn I returned to my Southern home with a heart full of joyous memories. As I recall that visit now I am filled with wonder at the richness and variety of the experiences that cluster about it. It seems to have been the beginning of everything. The treasures of a new, beautiful world were laid at my feet, and I took in pleasure and information at every turn. I lived myself into all things; I was never still a moment; my life was as full of motion as those little insects that crowd a whole existence into one brief day. I met many people who talked with me by spelling into my hand, and thought in joyous sympathy leaped up to meet thought, and behold, a miracle had been wrought! The barren patch between my mind and the minds of others blossomed like the rose. I spent the autumn months with my family at our summer cottage, on a mountain about fourteen miles from Tuscumbia. It was called Fern Quarry, because near it there was a limestone quarry long since abandoned. Three frolicsome little streams ran through it from springs in the rocks above, leaping here and tumbling there in laughing cascades wherever the rocks tried to bar their way. The opening was filled with ferns which completely covered the beds of limestone and in places hid the streams. The rest of the mountain was thickly wooded. Here were great oaks and splendid evergreens with trunks like massy pillars, from the branches of which hung garlands of ivy and mistletoe, and persimmon trees the odor of which pervaded every nook and corner of the wood — an illusive, fragrant something that made the heart glad. In places the wild muscadine and scuppernong vines stretched from tree to tree, making arbors which were always full of butterflies and buzzing insects. It was delightful to lose ourselves in the green hollows of that tangled wood in the late afternoon and to smell the cool, delicious odors that came up from the earth at the close of day. Many visitors came to Fern Quarry. In the evening, by the camp-fire, the men played cards and whiled away the hours in talk and sport. They told stories of their wonderful feats with fowl, fish and quadruped — how many wild ducks and turkeys they had shot, what “savage trout” they had caught, and how they had bagged the craftiest foxes, outwitted the most clever ‘possums and overtaken the fleetest deer, until I thought that surely the lion, the tiger, the bear and the rest of the wild tribe would not be able to stand before these wily hunters. “To-morrow to the chase!” was their good-night shout as the circle of friends broke up for the night. The men slept in the hall outside our door, and I could feel the deep breathing of the dogs and hunters as they lay on their improvised beds. Later in the morning we made preparations for a barbecue. A fire was kindled at the bottom of a deep hole in the ground, big sticks were laid crosswise at the top, and meat was hung from them and turned on spits. Around the fire squatted negroes, driving away the flies with long branches. The savory odor of the meat made me hungry long before the tables were set. At the height of the bustle and excitement of preparation the hunting party made its appearance, straggling in by twos and threes, the men hot and weary, the horses covered with foam, and the jaded hounds panting and dejected — and not a single kill! Every man declared that he had seen at least one deer, and that the animal had come very close; but however hotly the dogs might pursue the game, however well the guns might be aimed, at the snap of the trigger there was not a deer in sight. They had been as fortunate as the little boy who said he came very near seeing a rabbit — he saw his tracks. The party soon forgot its disappointment, however, and we sat down, not to venison, but to a tamer feast of veal and roast pig. ON MORNINGS when I did not care for a ride my teacher and I would start after breakfast for a ramble in the woods, and allow ourselves to get lost amid the trees and vines, with no road to follow except the winding paths made by cows and horses. Frequently we came upon impassable thickets which forced us to take a roundabout way. Overhead, the branches of the trees met to form a canopy, through which the sunlight came softened and made a wonderful checkerwork of light and shadow on the pine-needles. In places the trees were covered from the roots to the topmost branches with trailing moss, but usually the vines hid them from view. We always returned to the cottage with armfuls of laurel, goldenrod, ferns and gorgeous swamp-flowers, such as grow only in the South.Sometimes I would go with Mildred and my little cousins to gather persimmons. I did not eat them; but I loved their fragrance and enjoyed hunting for them in the leaves and grass. We also went nutting, and I helped them open the chestnut-burrs and break the shells of hickory-nuts and walnuts — the big, sweet walnuts! At the foot of the mountain there was a railroad, and it always interested the children to watch the trains whiz by. Sometimes a terrific whistle brought us to the steps, and Mildred told me in great excitement that a cow or a horse had strayed on the track. About a mile distant there was a trestle spanning a deep gorge. It was very difficult to walk over, the ties were wide apart and so narrow that one felt as if one were walking on knives. I had never crossed it until one day Mildred, Miss Sullivan and I were lost in the woods and wandered for hours without finding a path. Suddenly Mildred pointed with her little hand and exclaimed, “There’s the trestle!” We would have taken any way rather than this; but it was late and growing dark, and the trestle was a short cut home. I had to feel for the rails with my toe; but I was not afraid and got on very well, until all at once there came a faint “puff, puff” from the distance. “I see the train!” cried Mildred, and in another minute it would have been upon us had we not climbed down on the cross-braces while it rushed over our heads. I felt the hot breath from the engine on my face, and the smoke and ashes almost choked us. As the train rumbled by the trestle shook and swayed, until I thought we should be dashed to the chasm below. With the utmost difficulty we regained the track. Long after dark we reached home and found the cottage empty; for the family, being anxious, were all out hunting for us. THE winter of 1889-90 I spent in the North. One day I went on a visit to a New England village with its frozen lakes and vast snow-fields. It was then that I had opportunities such as had never been mine to enter into the treasures of the snow. Then came a day when the leaden sky portended a snowstorm. We rushed out-of-doors to feel the first few tiny flakes descending. Hour by hour the flakes dropped silently, softly from their airy height to the earth, and the country became more and more level. A snowy night closed upon the world, and in the morning one could scarcely recognize a feature of the landscape. All the roads were hidden, not a single landmark was visible, only a waste of snow with gray trees rising out of it. In the evening a wind from the northeast sprang up, and the flakes rushed hither and thither in furious mÃªlÃ©e. Round the great fire we sat and told merry tales, and frolicked and quite forgot that we were in the midst of a desolate solitude, shut in from all communication with the outside world. But during the night the fury of the wind increased to such a degree that it thrilled us with a vague terror. The rafters creaked and strained, and the branches of the trees surrounding the house rattled and beat against the windows, as the winds rioted up and down the country. Narrow, winding paths were shoveled through the drifts. I put on my cloak and hood and went out. The air stung my cheeks like fire. The whole country was white and gold. Half walking in the narrow paths, half working our way through the lesser drifts, we succeeded in reaching a pine grove just outside a broad pasture. The trees stood motionless and white like figures in a marble frieze. There was no odor of pine-needles in that fairyland. The rays of the sun fell upon the trees, so that the twigs sparkled like diamonds and dropped in showers when we touched them. So dazzling was the light, it penetrated even the darkness that veils my eyes. As the days wore on the drifts gradually shrank, but before they were wholly gone another storm came, so that we scarcely saw the brown earth once all winter. At intervals the trees lost their icy covering, and the bulrushes and underbrush were robbed of their diamonds; but the lake lay frozen and beautiful beneath the sun. Our favorite amusement during that winter was tobogganing. In places the shore of the lake rises abruptly from the water’s edge. Down these steep slopes we used to coast. We would get on our toboggan, a boy would give us a shove, and off we would go! Plunging through drifts, leaping hollows, swooping down upon the lake, we would shoot across its smooth, gleaming surface to the opposite bank. What joy! What exhilarating madness! For one wild, glad moment we snap the chain that binds us to earth, and joining hands with the winds we feel ourselves divine! IT WAS in the spring of 1890 that I learned to speak. For I a long time I had known that the people about me used a method of communication quite different from mine. The impulse to utter audible sounds had always been strong within me. I used to make noises, keeping one hand on my throat while the other hand noted the movement of my lips. I was pleased with anything that made a noise and liked to feel the cat purr and the dog bark. I also liked to keep my hand on a singer’s throat, or on a piano when it was being played. Before I lost my sight and hearing I was fast learning to talk, but after my illness it was found that I had ceased to speak because I could not hear a sound. I would sit in my mother’s lap all day long and keep my hands on her face because it amused me to feel the motions of her lips; and I moved my lips, too, although I had forgotten what talking was. My laughter and cries were natural; and for a while I made many sounds and word-elements, not because they were a means of communication, but because the need of exercising my vocal organs was imperative. However, there was one word the meaning of which I still remembered: “water.” I pronounced it “wa-wa,” and even this became less and less intelligible until the time when Miss Sullivan began to teach me. I stopped using it only after I had learned to spell the word on my fingers. No deaf child who has earnestly tried to speak the words which he has never heard — to come out of the prison of silence, where no tone of love, no song of bird, no strain of music can ever pierce the stillness — can forget the thrill of surprise, the pathos of pain, the joy of discovery which have come over him when he first learns to utter a word. Only such a one can appreciate the eagerness with which I talked to my toys, to stones, to trees, to birds and dumb animals, or the delight I felt when at my call my little sister ran to me or my dogs obeyed my commands. It is an unspeakable boon to me to be able to speak in winged words that need no interpretation. As I talk, happy thoughts flutter up out of my words that might perhaps have struggled in vain to escape the barriers of my fingers. Before I even heard that a deaf child could learn to speak I was conscious of dissatisfaction with the means of communication I already possessed. One who is entirely dependent upon the manual alphabet has always a sense of restraint, of narrowness in one’s sphere of life. Such was the feeling that began to agitate me with a vexing, forward-reaching sense of a lack that should be filled. My thoughts would often rise and beat up like birds against the wind; and I persisted in using my lips and voice. Friends tried to discourage this tendency, fearing lest it would hurry me on to sorrow and disappointment; but I never heeded them; and an incident soon occurred which led to the breaking down of this great barrier: I heard the story of Ragnhild Kaata. In 1890 Mrs. Lampson, who had been one of Laura Bridgman’s teachers, and who had just returned from a visit to Norway and Sweden, came to see me and told me of Ragnhild Kaata, a deaf and blind girl in Norway who had actually been taught to speak. The lady had scarcely finished telling me about this girl’s success before I was on fire with eagerness: I resolved that I, too, would learn to speak. I would not rest satisfied until my teacher took me, for advice and assistance, to Miss Fuller, principal of the Horace Mann School. This lovely, sweet-natured lady offered to teach me herself, and we began the twenty-sixth of March. HER method was this: she passed my hand lightly over her face, and let me feel the position of her tongue and lips when she made a sound. I was eager to imitate every motion and in an hour had learned six elements of speech: M, P, A, S, T, I. Miss Fuller gave me eleven lessons in all. I shall never forget the surprise and delight I felt when I uttered my first connected sentence: “It is warm.” True, they were broken and stammering syllables; but they were human speech! My soul, conscious of new strength, came out from its prison-house, and was reaching through those broken symbols of speech to all knowledge and all faith. But it must not be supposed that I could really talk in this short time. Far from it. I had learned only the elements of speech. Miss Fuller and my teacher, Miss Sullivan, could understand me, but most people would not have understood one word in a hundred. Nor is it true that, after I had learned these elements, I did the rest of the work myself. But for Miss Sullivan’s genius, untiring perseverance and devotion, I could not have progressed as far as I have toward perfect, natural speech. In the first place, I labored night and day before I could be understood even by my most intimate friends; in the second place, I needed Miss Sullivan’s assistance constantly in my efforts to articulate each sound clearly and to combine all sounds in a thousand ways. Even now she calls my attention daily to mispronounced words. All teachers of the deaf know what this means, and only they can at all appreciate the peculiar difficulties with which I had to contend. I was wholly dependent on my fingers: I had to use the sense of touch in catching the vibrations of the throat, the movements of the mouth and the expression of the face; and often this sense was at fault. In such cases I was forced to repeat the words or sentences, sometimes for hours, until I felt the proper “ring” in my own voice. My work was practice, practice, practice. Discouragement and weariness cast me down frequently; but the next moment the thought that I should soon be at home and show my loved ones what I had accomplished renewed my courage and spurred me on, and I eagerly looked forward to their pleasure in my achievement. “MY LITTLE sister will understand me now,” was a thought stronger than all obstacles. I used to repeat ecstatically, “I am not dumb now.” I thought especially of my dear mother, and I could not be despondent while I anticipated the delight of talking to her myself and reading her responses from her lips. It astonished me to find how much easier it is to talk than to spell on the hand, and I discarded the manual alphabet as a medium of communication on my part; but Miss Sullivan and a few friends still use it in speaking to me, for it is more convenient than lip-reading. Just here, perhaps, I had better explain our use of the manual alphabet, which seems to be a source of wonder and perplexity to people who do not know us. One who is reading or talking to me spells with his right hand, using the manual alphabet usually employed by the deaf. I place my right hand on the hand of the speaker so lightly as not to impede its motion. The position of the hand is as easy to feel as it is to see. I do not feel each letter any more than others see each letter separately when they read with their eyes. Constant practice makes the fingers very flexible, and some of my friends spell rapidly — about as fast as an expert writes on a typewriter. The mere spelling is, of course, no more an act of consciousness than in writing one is conscious of each letter. The manual alphabet is an old, trusty friend, but speech is the dearest treasure I have won; when I made it my own I could hardly wait to show it to those I loved. It is hard for some people to believe that the story of Helen Keller’s life is really her own story, actually composed by the blind girl herself and written by means of her typewriter. For this reason it is a pleasure to announce that her articles will be supplemented by two others, in which her teacher, Miss Annie M. Sullivan, and one of her intimate friends, Mr. James Albert Macy, will tell all about her preparation of the wonderful story now appearing in THE JOURNAL, and show Miss Keller as her friends see her day by day. Transcription source: Keller, Helen, “The Story of My Life Series: Part 3,” The Ladies’ Home Journal, June 1902. Retrieved May 2, 2014 from Disability History Museum, http://www.disabilitymuseum.org/dhm/lib/detail.html?id=2397&&page=1.